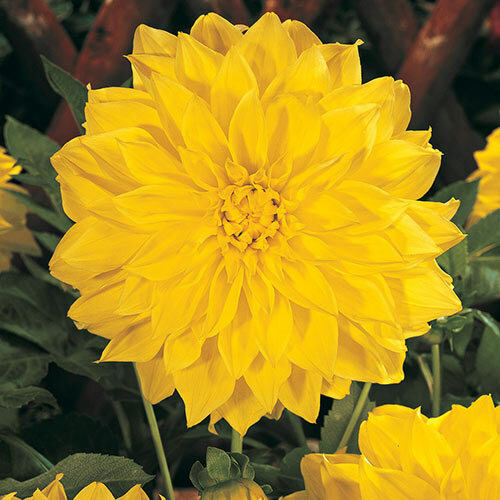 Kelvin Floodlight Dahlia: Incredible 18–23 cm, golden-yellow blooms are more intense than sunshine. 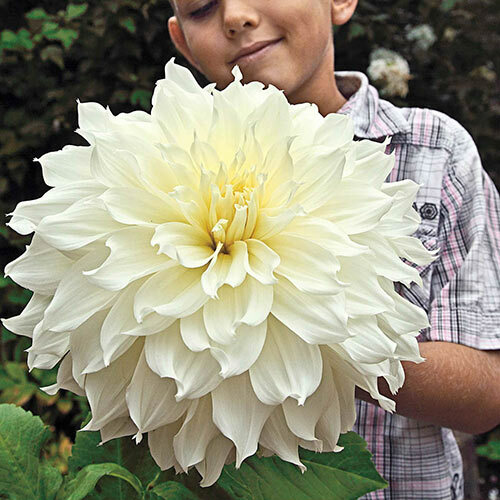 The most spectacular yellow dahlia ever developed, award-winning Kelvin Floodlight grows 90-120 cm tall. 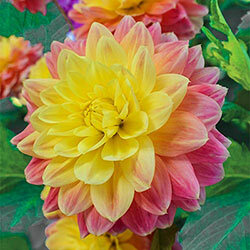 Islander Dahlia: Inspiring size and tropical shades. 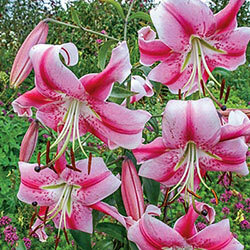 Massive, 20–25 cm blooms make a sizzling summer display in a variety of pink shades. 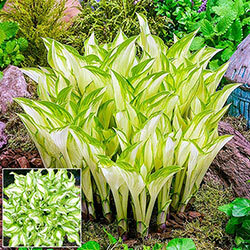 With its impressive, eye-catching blooms, Islander is an instant focal point behind other sunloving plants. 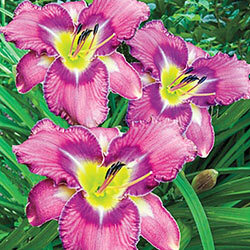 Its lively form will keep your borders in the spotlight all summer and fall! 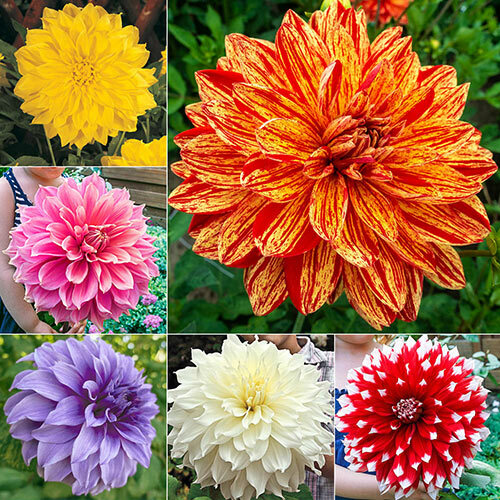 Neo Dahlia: Big, festive blooms really get the garden party started. 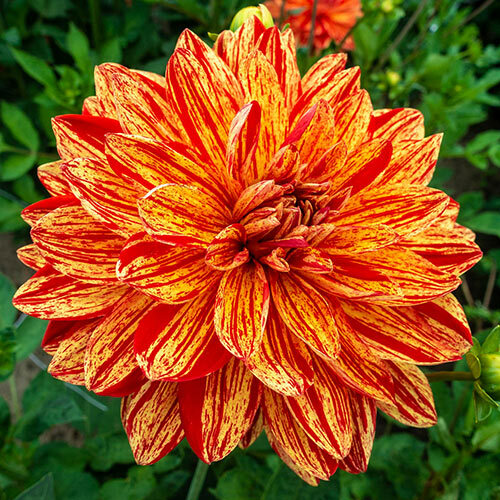 Let the huge, 20–22 cm flowers of Neo dahlia take your garden to the next level with its sunny yellow hues accented with bold red streaks. 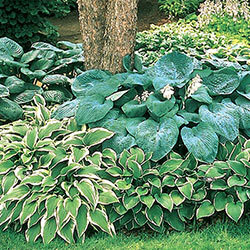 They really set a merry tone in sunny borders and mixed beds, where they mingle nicely with other summer-blooming perennials. Move the party indoors by creating a fresh floral arrangement or simple, singlevariety bouquet. Makes a fine focal point planting, too. 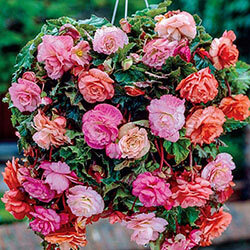 Pinch off spent blooms for bigger flowers. 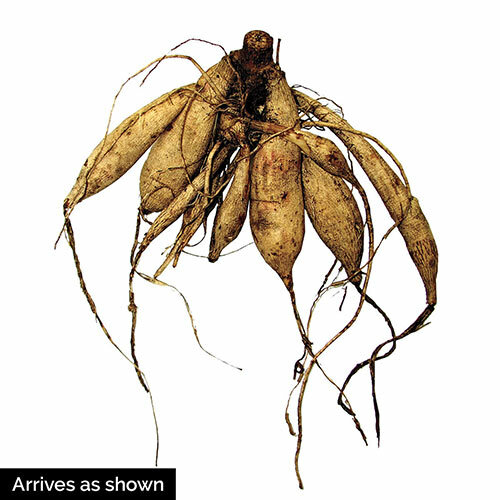 Fleurel Dahlia: Announcing the queen of white dahlias! With delicate shades of cream that trace the centres of each elegant white petal, it's no wonder Fleurel has been dubbed royalty. 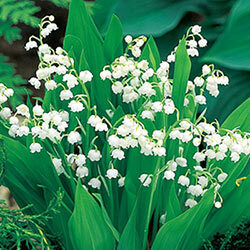 Tall, sturdy plants grow to 120 cm and are laden with masses of lush, 18–23 cm flowers blooms all season long. 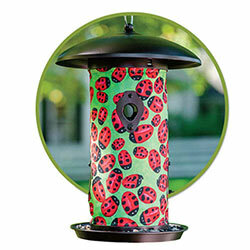 Give them a special spot where they can reign supreme and make a lovely garden statement to capture everyone's attention. Pinch secondary buds to enhance flowering. 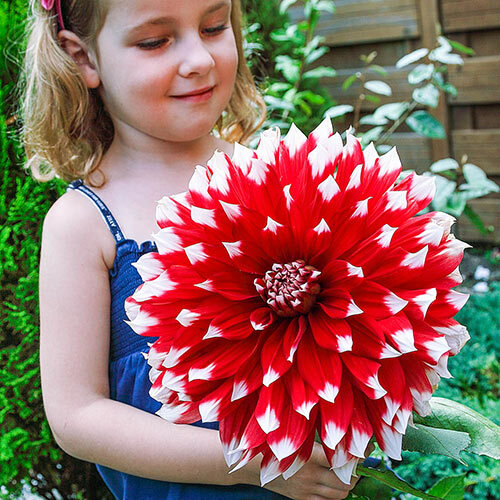 Red Empire Dahlia: Red and white wow! Fill your back borders with eye-catching colour, thanks to fully double, bright red flowers tipped in white. Very little maintenance required for the abundant, 20 cm blooms. If spent flowers are removed, Red Empire will keep blooming all the way until mid to late fall! 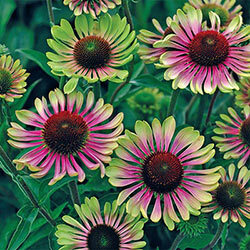 Plenty of opportunity to dazzle in both borders and bouquets! 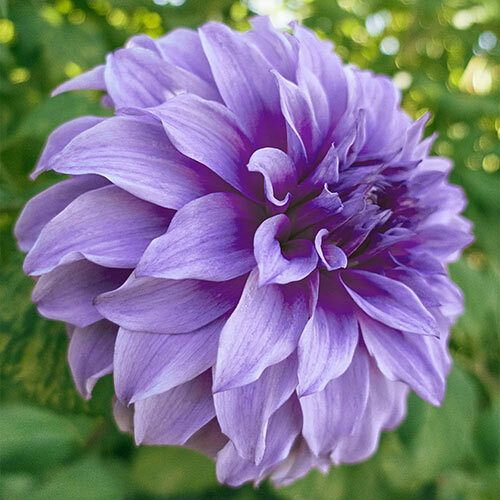 Vassio Meggos Dahlia: Unique ball-shaped blooms are really something to see! 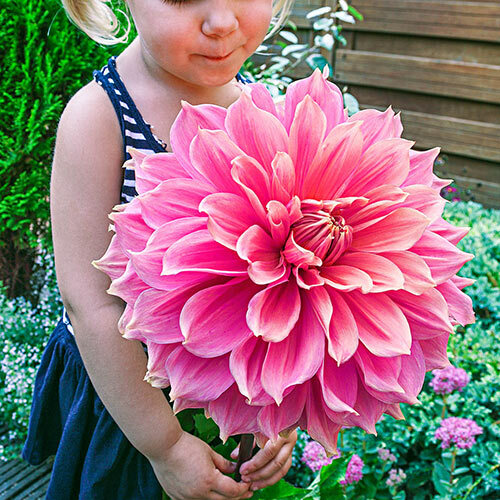 These enormous 25 cm flowers are naturally lovely in myriad shades of lavender-pink. 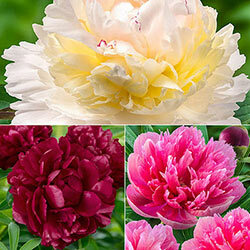 A show-winning garden beauty, it is a prolific bloomer that bears its blossoms from summer to frost. 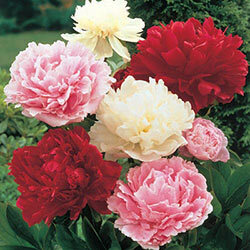 In fact, it's not unusual to have up to 25 giant flowers per plant. 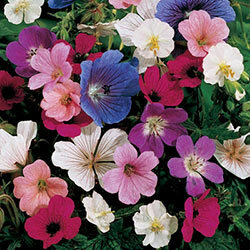 Creates a marvelous focal point planting, but it's just as nice at the back of a sunny border. 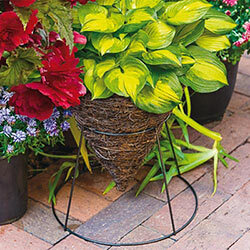 Makes a knockout addition to floral centrepieces— or as a sole bloom in a simple vase.